This spacious, newly renovated and nice apartment in two levels is situated on the 5th and 6th floor of a nice building in Prague 1. The building has an elevator. 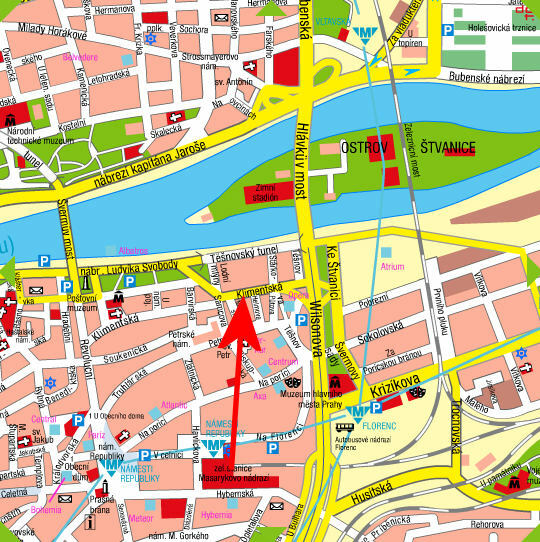 With the location in Prague 1, Nove Mesto (founded by Charles the Fourth in 1348), you have all the sights and exiting shopping and dining possibilities of Prague within a few minutes of walking - and also metro and tram lines are close. Even the river is within a couple of minutes in distance. The apartment is 131 square meters large. The lower level consists of a nice entrance hall, a bedroom with 2 single beds which can be arranged as a double bed, and a living room with a kitchen corner equipped with electric oven, gas hub, electric cooking kettle, coffee maker, iron and ironing board, toaster, dishwasher and a fridge with a freezer. There is also a washing machine. 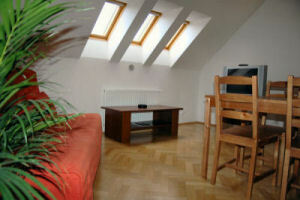 The living room is furnished with a large dining room table and a good quality double sofabed. There is Satellite TV. In the lower level there's also a bathroom with a walk in shower. On the upper level you'll find 2 separate bedrooms, each with a double bed and wardrobes, and in the largest bedroom there’s also a double sofabed – so the sleeping arrangements are truly flexible. There's a spacious landing furnished with a double sofabed. The bathroom on the top level has a large corner bathtub. Both bathrooms have a hairdryer.